Today, we are pleased to present a guest contribution written by Laurent Ferrara (Banque de France), Ignacio Hernando (Banco de España) and Daniela Marconi (Banca d’Italia), summarizing the introductory chapter of their book International Macroeconomics in the wake of the Global Financial Crisis. The views expressed here are those solely of the author and do not reflect those of their respective institutions. A decade after the eruption of the Global Financial Crisis (GFC), the world economy has finally returned to a more sustained pace of expansion (see Fig. 1). Yet major challenges still remain, as the engines of long-run growth have still not recouped their pre-crisis power. The subdued growth in productivity in advanced and emerging countries alike, the slow recovery in investment and the persistently low income elasticity of international trade are all casting a long shadow over growth in the medium and longer term, calling for a deeper investigation of their root causes and of the possible policy remedies. However, disentangling the cyclical factors from the structural ones, in order to engineer the most appropriate policy responses is proving to be a difficult task. The first section of this book aim to shed some light on the structural and cyclical factors at play behind the slowdown in the supply-side drivers of economic growth, by revisiting the debate on the secular stagnation hypothesis (P. Pagano and M. Sbracia); the slowdown in productivity growth in emerging market economies (E. Di Stefano and D. Marconi; I. Kataryniuk and J. M. Martinez-Martin) as well as the debate over rising income and wealth inequality, especially in advanced economies (R. Cristadoro). The second section of this book is devoted to the analysis of the components of aggregate demand in the wake of the GFC. A. Borin, V. Di Nino, M. Mancini and M. Sbracia investigate the causes of the sluggish recovery in global trade volumes and the fall in the income elasticity of trade. They show that the income elasticity of trade is highly cyclical, rising above unity during periods of above-trend GDP expansion and falling back to around unity in the long-run. As a consequence, one would expect income elasticity to recover as economic activity, and especially investment, goes back to their long-run trend, returning towards one and only exceeding this value if GDP and investment growth remain persistently above trend. In the years preceding the GFC, above-trend growth in aggregate demand, and particularly in consumption in the United States, was fueled by the expansion of debt. However, excessive indebtedness eventually resulted in the sub-prime crisis which triggered the GFC (V. Grossman-Wirth and C. Marsilli). 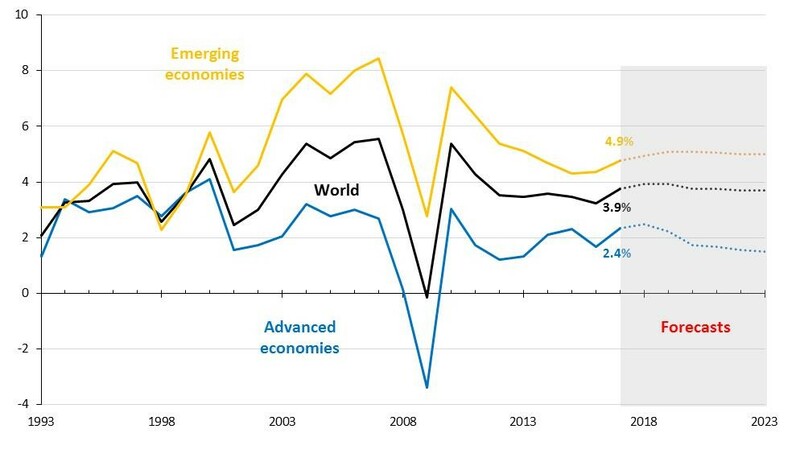 Alongside trade, and strictly connected to it, business fixed investment remained depressed worldwide, particularly in major advanced economies, for a prolonged period of time after the crisis, only showing initial signs of recovery in recent months (see Fig. 2 below). The analysis conducted by I. Buono and S. Formai shows that the GFC has brought about a structural change in the determinants of investment demand, with financial uncertainty affecting the speed of recovery in fixed capital formation to a greater extent than previously. Moreover, in some countries, most notably the peripheral European countries, business investment has become more sensitive to changes in borrowing costs in recent years.